Glass has been used for thousands of years as a decoration. 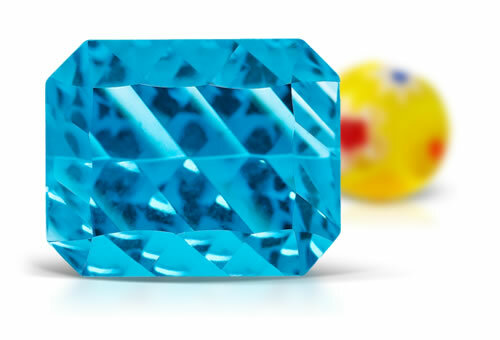 It is sometimes employed as a gemstone simulant, but is often appreciated entirely upon its own merits, especially when formed with a high level of artistry. RI, magnification and warm to touch. Since glass has a low mohs hardness and is usually molded the stones will have mold marks, rounded facet edges, concave facets. It will also sometimes show orange peel effect or a bumpy surface that resembles an orange peel. Glass will often show cavities on the surface of the stone and swirl lines and glass bubbles internally.